Llangeview Lodge01291 673338work Guest AccommodationSituated in the picturesque Usk valley, Roland, Beverley and Holly extend a warm welcome to the newly named and completely refurbished Llangeview Lodge. The Lodge has been created as a welcoming home for weary walkers and intrepid explorers after a day in the surrounding welsh valleys. Our guests are invited to relax in the cosy bar where we have good wine and local real ales alongside the other popular bar room tipples. Visit our adjoining restaurant where the food is home cooked using fresh local produce when possible to enhance the freshness and taste of every individual plate of food whether it be a hearty breakfast, bar snacks or a la carte. 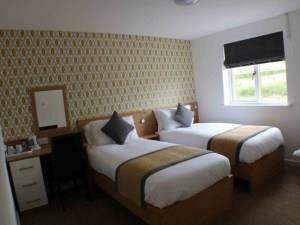 The bedrooms are bright and airy each have en-suite facilities, flat screen tv, tea/coffee and free WiFi. Some of our rooms have views of the surrounding countryside. Llangeview Lodge is situated a couple of minutes outside of Usk. The town is a riot of colour as everyone joins in the Britain in bloom competition with great success as Usk wins on a regular basis. Close to the Brecon Beacons National Park, the Wye valley and the Forest of Dean. The area is a haven for walkers, bikers, golfers, fishing enthusiasts and nature lovers looking for a break from the hustle and bustle of everyday life. Cardiff is a 30 minute drive for exploring, shopping, visiting one of the numerous castles of the area and of course Rugby. Newport is just 20 minutes away. The world renowned Celtic Manor is a 10 minute drive along with a futher 10 courses in the vicinity. Usk gliding club is a couple of hundred yards down the lane for the more adventurous. So why not sample the comfort, warm welcome and great food of Llangeview Lodge.